Over the last several years, I've transported puppies and small dogs in the cabin of planes like it is going out of style. Here's some tips I've gathered over the years. Besides the regular puppy transport bag, there are two major pieces of equipment I use to transport that I'll discuss in detail. Transporting a puppy is more difficult than adult dogs. For the most part, they aren't potty trained or crate trained. They don't ride well in cars, and they aren't always quiet. This is Basil, my Lowchen. She was a perfect angle during transport. All my lowchens were easy to transport. leash and collar - sometimes people forget! small snacks or chewies. I bring cheerio cereal and pressed rawhide pieces to keep puppies busy. sawdust. If the breeder uses sawdust to housetrain, you can grab a bagful as needed. Sprinkle onto the puppy pad to encourage urinating. Arrive at the airport. I carry on everything bungee corded together or in a large duffle bag. 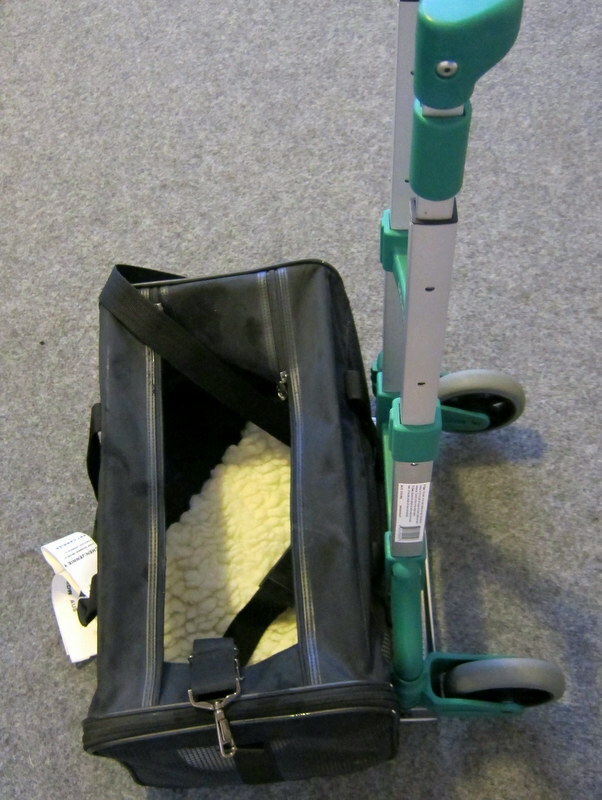 The folded crate and cart will fit in a duffle bag. Once I reach my destination, I rent a car. Drive to pick up puppy. When I leave the pick up location, I put the puppy in a hard sided crate. Proceed to drive back to departure airport. I try to potty the puppy at the very last moment on grass if available. Fold up the hard sided crate and insert into my bag. Put puppy in the soft sided carrier. 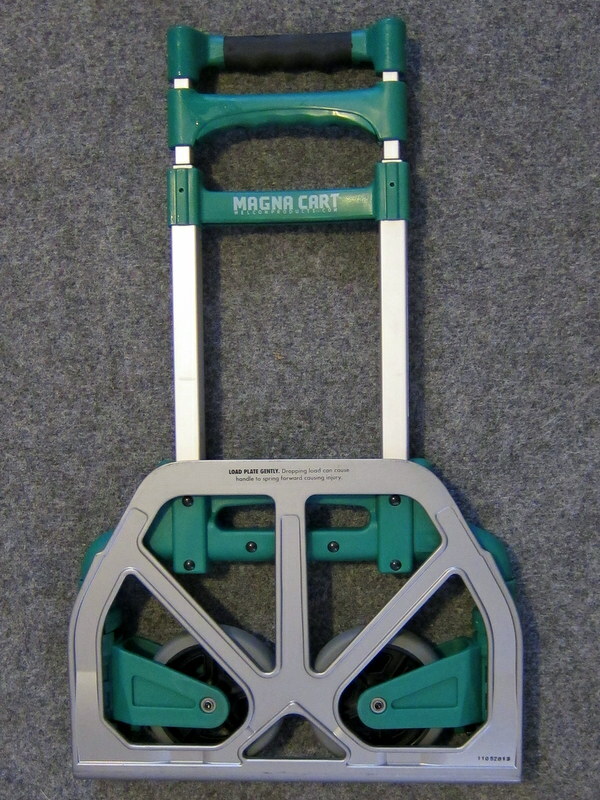 Place carrier on the Magna cart and head towards security. Get through security (I haven't been forced to go through the scanners with a puppy before, just the regular xray). Take the puppy for a long walk in the carrier on the Magna cart. Hopefully, puppy falls asleep. I may also take the puppy to the bathroom and encourage him/her to pee using the pee pee pad. Get on the plane, fold up the Magna cart and place into the overhead compartment, place puppy in front of your feet, and ride home. Once we land, I unfold the Magna cart and wheel the puppy out of the airport. These are just guidelines and what I like to do. 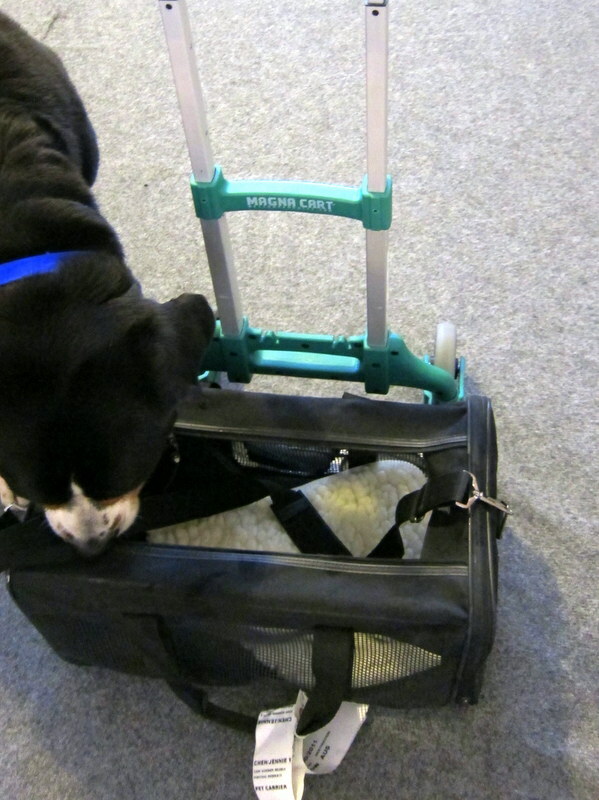 It has worked well for me, and I hope it helps you figure out how to transport your puppy. Follows are details about the folding crate and Magna cart. 1. 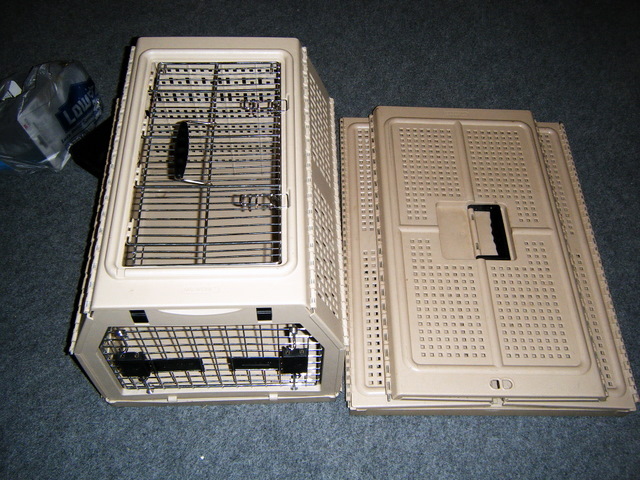 A folding nylabone crate size (21x16x15 inches fits into the overhead compartment). These are really difficult to find. I have six of them in three different sizes, and I hang onto them like no one's business. I used to see them on eBay and Craigslist, but I haven't seen one posted in a year or so. 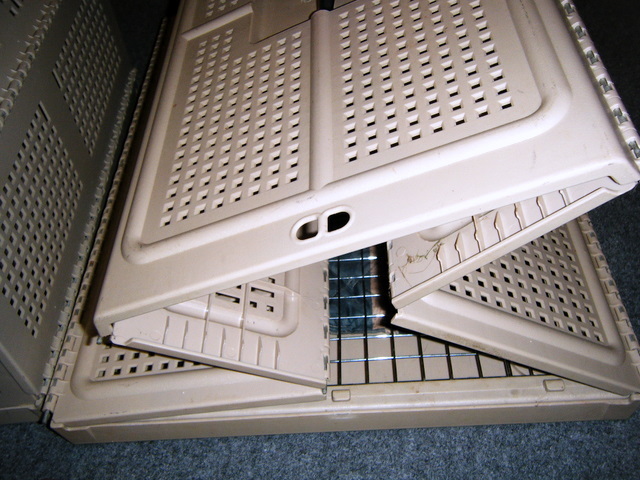 The other option is using a wire folding crate, but those are much heavier to transport. 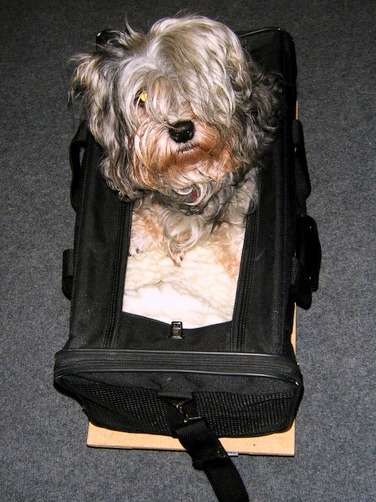 You might be asking why you would need a crate when you already have a puppy carrier for the plane. Simple. Puppies are not easily contained in those bags. There will be times when the puppy is not at the airport in the bag. During those times, you'll want a way to contain the poop and pee generating puppy that probably has a desire to chew things. If you've ever tried to transport eight week old puppies in a car, you'll know what I mean. I distinctly remember taking two puppies around that age to the vet years ago. One was on my head gnawing my hair, and I think the other one was in my lap as I was driving. I'm not sure how I survived. 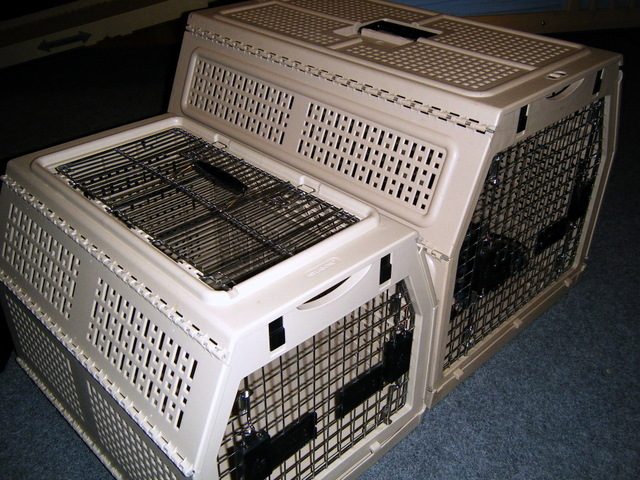 I consider an additional hard sided crate a MUST when picking up puppies. This is the 24 inch model next to a 27 inch model. The 24 inch model fits up to a 20 lb dog. Not comfortably, not it fits. Here they are - open and folded down. I have a strap that goes around them to keep them closed. You can fold one down even with a crate mat inside. I LOVE these crates. 2. A Magna Cart. I really LOVE these because they can fold and go into the overhead compartment. I got my first one at Lowe's, but they now carry a newer model that doesn't necessarily fit into the plane's overhead compartment. This particular model is at Costco and on Amazon.com. They are anywhere from $20-30 depending on where you purchase them. I take this on almost every trip - car or plane. I use it for hauling beer, carrying my heavy backpack through the airport, and at dog shows. I've never had it count as an additional carry on because I fold it up and slide it right next to my items in the overhead storage on planes. No one even realizes that it isn't attached to my bag. I could also bungee cord it to my bag, but I haven't had to do that. This piece of equipment is essential for several reasons. 1. That 20 lb mastiff puppy in your bag will get heavy. You can't take the puppy out of the bag at the airport, and you don't want to plant the seed of thought in people's head that the puppy is too big to fit under the cabin - unless of course you want to ship the puppy in cargo. 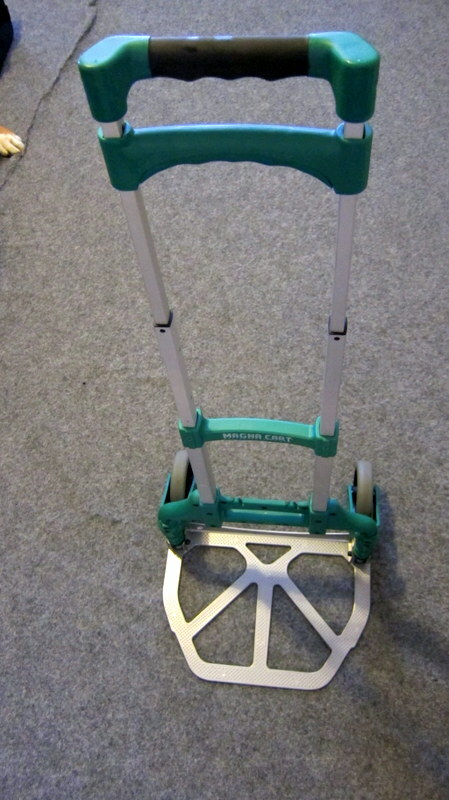 Using this snazzy hand cart, you can easily run through the airport without straining your shoulders. You don't give away any visible cues that the puppy might be a big puppy. 2. Some puppies are noisy, and I've used the cart to rock puppies to sleep in the bag. I almost got denied a flight before we loaded because of a loud puppy (wasn't one of mine). I wheeled him around rocking him gentle until he dozed off. He woke up on the plane and started his "I want to run around screaming!" Thankfully, the engine noise drowned him out. Here's the cart folded up. It is just so nifty. I have three of these. Mouse asks, "Whatcha bringing back?" 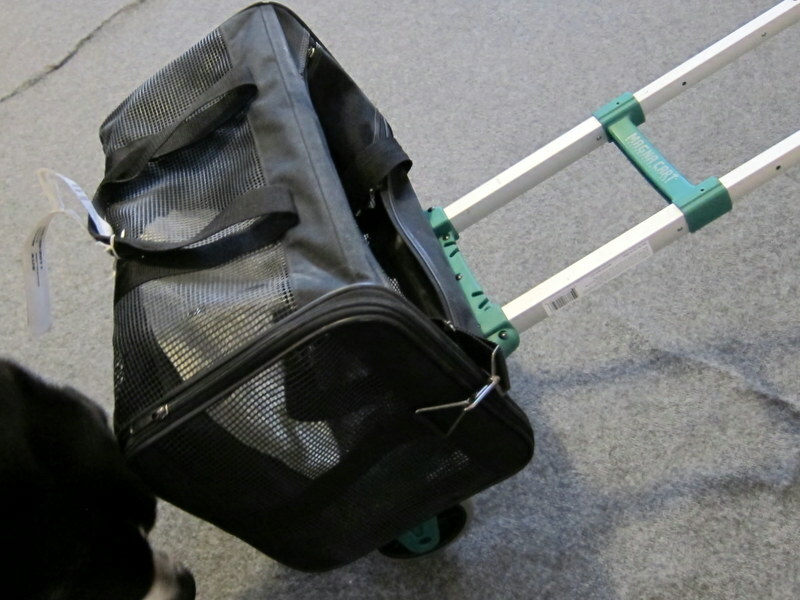 Here's a side view of the puppy bag on the cart. And this is how we run through the airport.